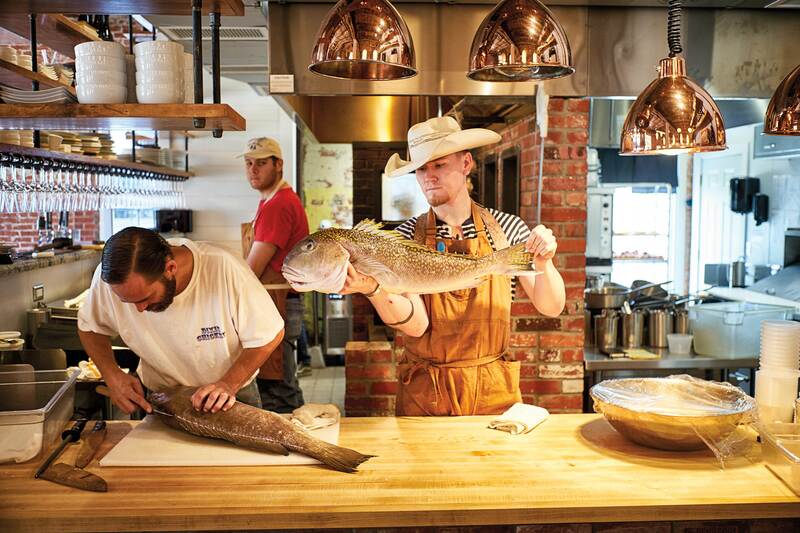 Chef Brian Light and sous chef Travis Raabe prepare fresh-caught fish. It was the bok choy that changed Chef Brian Light. Or maybe it was that perfect heirloom tomato, soft and sweet, the way it tasted impossibly good after ripening in the sun. Really, it was everything that grew in the experimental garden that Brian and his wife, Amanda, planted on their Bryan farm in 2011, sowing the seed for a restaurant and catering business built on a foundation of honest, farm-to-table cuisine. Since 2013, the Lights have hosted al fresco Full Moon Dinners nine months of the year under the canopy of trees on their farm. The evenings feature a nine-course tasting menu; during the dessert course, about 50 guests make their way down a path to sit under the stars in the garden. 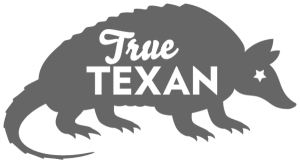 The Lights also maintain a busy catering business, serving weddings and other special events. Open Thu-Sat 5-10 p.m. and Sun 11 am.-2 p.m.
Full Moon Dinners are by reservation only; visit the website for upcoming dates and reservations. 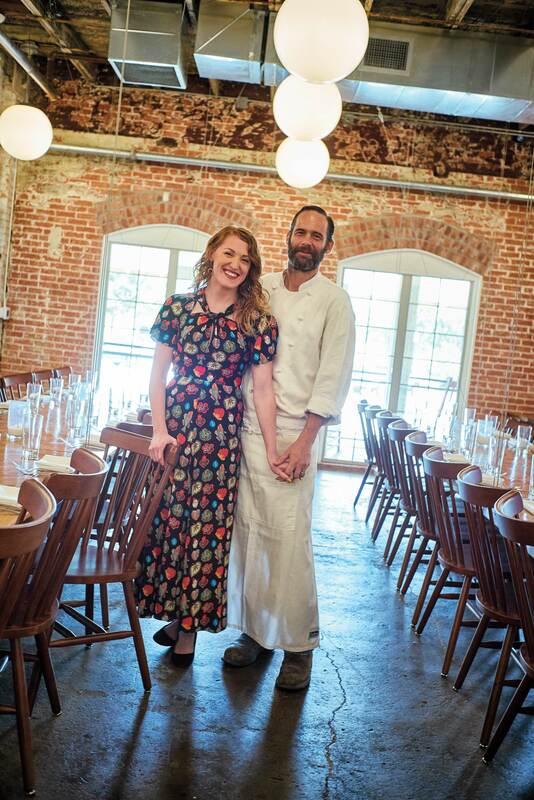 This past May, the couple opened their first brick-and-mortar restaurant, Ronin, which can seat 134 in a restored 100-year-old icehouse building in downtown Bryan. They hadn’t always planned to open a restaurant, but their growing business—from the sellout Full Moon Dinners to a booked calendar of catering events—allowed them to dream a little bigger. “It’s like you took Grandma’s house and a fine-dining restaurant and squished them together,” Brian says. Ronin’s husband-and-wife team, Amanda and Brian Light. Inside the restaurant, two long community tables serve as the focal point of the main dining area. Facing the open kitchen and its wood-fired grill, the tables are suspended on wires that can raise and lower as needed for added event space. There’s also a more private dining room with traditional two- and four-top tables inlaid with wood from the original icehouse floors. Brian whips up dishes in the back of the house while Amanda staffs the front. When you leave your seat, your cloth napkin is always folded for you. Though there’s an acute attention to detail, the atmosphere isn’t stuffy. Items range from $9 to $12 for small plates and up to $25 for entrees, and there is a suggested wine pairing for each dish. Staffers wear dark-wash jeans; you don’t have to restrict your visits to special occasions only. “Ronin” refers to a Japanese samurai without a master, and it conveys Brian’s respect and appreciation for Japanese cuisine and culture, which blossomed while studying hospitality in Japan and later working for “Iron Chef” Masaharu Morimoto in Philadelphia. 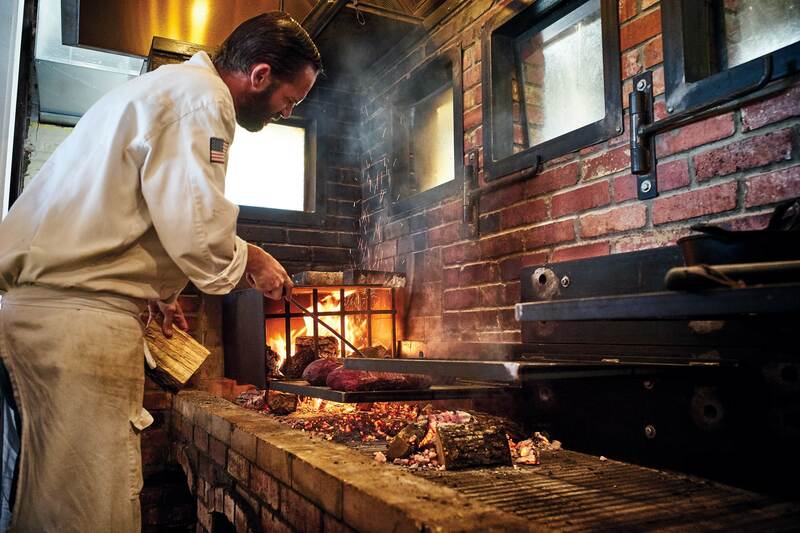 Chef Brian Light roasting wagyu beef to be served with chimichurri, fried okra, and peas. At Ronin, farm-to-table is not just lip service. The Lights hired a full-time farmer, Corey Wahl (credited as “director of farm operations” on the menu), to cultivate the fruits and vegetables on their farm, seven miles west of the restaurant. Wahl picks produce to appear on plates that evening, or sets them aside to be preserved for use during the off-season. This summer, Ronin averaged 250 pounds of fresh vegetables a week. Meals start with complimentary “farmer snacks” (The Lights’ take on amuse-bouche). On a recent evening, a server delivered house-made pickles infused with coriander grown on the farm. Another farmer snack: pickled radish seed pods with chili pequin—“little bowls of lovely, whatever-it-is-that-we-have-an-abundance-of,” Amanda says. 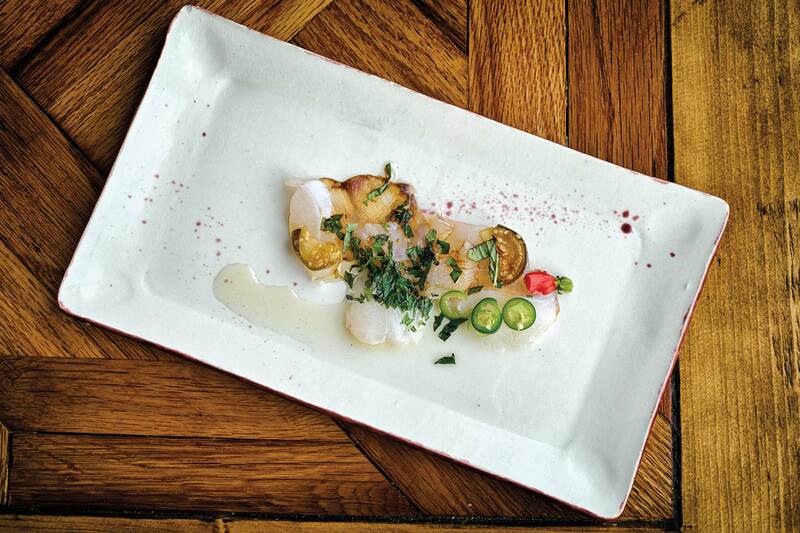 Grouper sashimi with pickled eggplant, Thai basil, and serrano peppers. At Ronin, the single-page menu ranges from a cheese board with Texas goat cheese, bread with strawberry jam, candied pecan, and kimchi, to a salad showcasing several varieties of fresh tomatoes and a sorghum-glazed pork chop with collard greens, to ratatouille prepared with eggplant, bell pepper, and roasted garlic. Finishing the meal, pastry chef Eliza Young creates beautiful desserts—her watermelon soufflé is pillow-soft with a light crunch at the top and bottom, infused with delicate sweetness. It’s a meal that would make Grandma proud.